A historical YA fantasy fiction set in the time of the Puritan-like society sounds like a winner, right? I am happy to say, “Yes!” I was a bit wary of this novel when I started to read it. I found myself getting angry and flustered in every chapter. About three to five chapters in, I figured out why. 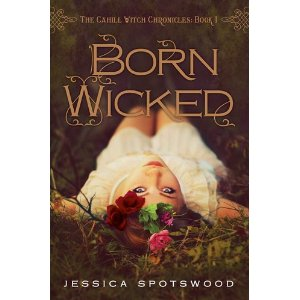 The author, Jessica Spotswood had me totally invested. I was experiencing the same emotions as the Cahill sisters. It started with the political and societal environment but is soon got deeper than that. I felt Cate’s anger at her mother. I resented the loneliness and feeling of neglect that Maura felt as a middle child (this hit very close to home being a middle child myself.) I envied the wisdom Tess gained from her curious and intellectual nature. Underlying it all, there is the constant undeniable push and pull of their bond as sisters and witches. Even more surprising, I didn’t find the obligatory love triangle (between Cate, Paul, and Finn) trite or characteristically familiar. The guys are on equal footing. There is no extra talent or leg-up for either of them. (Ms. Spotswood does foreshadow a possible paranormal consequence to one of the pairings but to us readers, not Cate herself.) It was refreshing to see such a normal struggle in a world permeated with Magic. This book is not without it’s curiosities, like why Dubai is mentioned as an ideal for these witches over and over again. I, for one, can’t wait to discover why and how the Cahill sisters will survive the politics, the Prophecy, and each other.